Tropic Thunder opens without a studio logo, or anything even hinting at the beginning of a film. It starts with fictional character Alpa Chino’s commercial for the energy drink ‘Booty Sweat.’ When this commercial ends, a fake preview begins for Scorchers VI; not until we see Ben Stiller’s character, actor Tugg Speedman turn around and face the camera do we realize that we’re actually watching the movie. The laughter doesn’t slow down until the “Dreamworks” logo appears, after a few more fake trailers. Tropic Thunder introduces us to its actor characters through fake previews, a stroke of brilliance that is the first of many in this endlessly creative, very intelligent, and breathlessly funny satire. The film, co-written and directed by Ben Stiller, is a clever dissection of film, acting, and the entertainment industry as a whole. It picks apart Hollywood, analyzes it for a second, and then satirizes it endlessly with affection. And the laughs generated by the satire are extremely frequent and extremely large; once Stiller appears on screen in the Scorchers trailer, I was doubled up with laughter, and I didn’t straighten up until the car ride home. And what better way to spoof Hollywood than with a big war movie; based on an acclaimed novel, the movie-within-the-movie “Tropic Thunder” is full of some of the biggest fictional actors. There’s Tugg Speedman (Ben Stiller), the highest grossing action star of all time, who has recently endured a string of flops, the worst being his ‘serious’ turn in the film Simple Jack, about a mentally retarded farm boy. Jeff “Fats” Portnoy (Jack Black), is a low-brow comedian whose claim to fame is the “Fatties” series of films; he’s also a drug addict. And at the center of attention is 5-time Oscar winner Kirk Lazarus, an Australian actor who stays in character “until the DVD commentary,” who underwent skin pigmentation surgery to play the platoon’s African-American leader (Robert Downey Jr. is essentially playing himself times 1000). These characters sound familiar? That’s the brilliance of the movie; we know these actors, and we know their characteristics. Yes, these characters are over the top, but not outside the realm of possibility. Kirk Lazarus bleaching his skin black doesn’t seem so ridiculous when you consider that, in real life, Daniel Day-Lewis refused to wear a warm jacket when he caught pneumonia while shooting Gangs of New York, his reasoning being that those kinds of clothes didn’t exist in the time period. These actors are then plummeted into the heart of the jungle when the director gets fed up and decides to shoot the film guerilla-style. Stiller and the gang imagine what would happen if actors like these were actually put in this situation, and this idea is realized to its full potential. Things go wrong and the only one who realizes they aren’t shooting a movie anymore is Lazarus, who stays in character despite that. The film is an ensemble, and while Robert Downey Jr. may have received third billing, but he’s the star of the show in my book. Lazarus never breaks character, talking ‘jive’ the entire time; from beginning to end, Downey Jr. never uses a sound that resembles his real voice. Lazarus provides some of the biggest laughs with his often incomprehensible speech pattern, with one of the best parts being when he tells Speedman the dangers of going “full-retard” in a movie. Stiller is in top form as Tugg Speedman, and this might be his best role to date. He simply nails the prima donna aspect of the character, and the character becomes more outlandish and goofy as the film progresses. Jack Black is a riot as the drug-addicted comedian going through withdrawal, and Jar Baruchel as the newbie actor on the film. Filling out the actor platoon is Brandon T. Jackson as rapper Alpa Chino (I’m surprised there isn’t a real life rapper with this name), whose irritation at Lazarus playing a black man is hilarious. These five leads do a great job on multiple levels. First off, each character feels entirely real and fully developed. By the ten minute mark, I wasn’t thinking “Ben Stiller.” I was thinking “Tugg Speedman.” You quickly forget that these characters aren’t actually actors in real life. The chemistry the gang has with each other is massive, and while comedies often fail when they have a large ensemble, Tropic Thunder would have failed without this aspect. And I haven’t even scratched the surface. As Speedman’s agent, Matthew McConaughey absolves himself of his many cinematic sins. He’s so good, I can actually forgive him for Fool’s Gold (now it’s your turn Kate Hudson). Steve Coogan’s brief role as the director is excellent. Nick Nolte is perfectly cast as Four Leaf Tayback, the man who wrote the memoir the fictional film is based on. Danny McBride is great as Cody, special effects wizard of the film. But I haven’t even mentioned the best bit. By now, I’m sure everyone’s heard something about the Tom Cruise cameo. Before the first trailer was released, this cameo was widely talked about, and critics have been hailing Cruise as the scene stealer. For one, his role isn’t a cameo; it’s a fairly substantial supporting role. Second, calling the performance “scene stealing” doesn’t do it justice. He has maybe five scenes, each one being substantially funnier than the last. Cruise is unrecognizable in heavy, heavy make-up, and you can only tell it’s him from the voice. His character, Les Grossman, is the studio head in charge of the film, and is angry as all hell from beginning to end. I’ve thought that Cruise was a good actor, but I’ve never imagined him a comedian. It’s great to see him in a such a different, hilarious role, and it’s nice to see that he’s not taking himself too seriously. The script by Ben Stiller, Etan Cohen, and Justin Theroux could have gone in so many wrong directions, given the premise, but like a good tightrope walker, the writers never fall off the line. The plot isn’t too simplistic or too complex, and the pacing is great. Ben Stiller’s directing is surprisingly good. He’s only directed one film before, Zoolander, hardly the kind of material that would suggest an aptitude for action directing. Also of note is the score by Theodore Shapiro, which is a spoof of the most epic, sweeping film scores. Without this excellent music, many of the scenes wouldn’t have been half as funny. Summer 2008 has been the best summer for movies I’ve ever experienced. There have been tons of terrific films this summer, with only a few disappointments. We started way back on May 2nd with Iron Man, a film which I gave a well-deserved A. 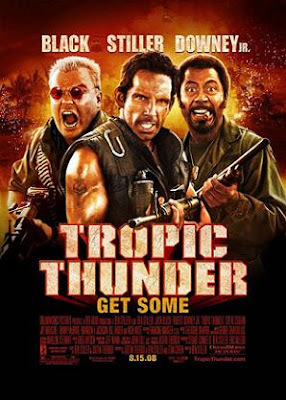 And now we have Tropic Thunder, which is possibly the best comedy of the year, and the last major film of the summer; it too gets an A (and they both stared Robert Downey Jr., interestingly enough). Any summer that starts and ends with an A must be a terrific season. Tropic Thunder is the perfect way to celebrate a historically excellent summer at the movies, one last cinematic hurrah for the warm months of 2008.